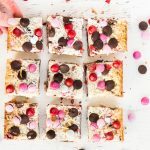 This M&M magic cookie bars recipe is so easy and delicious! 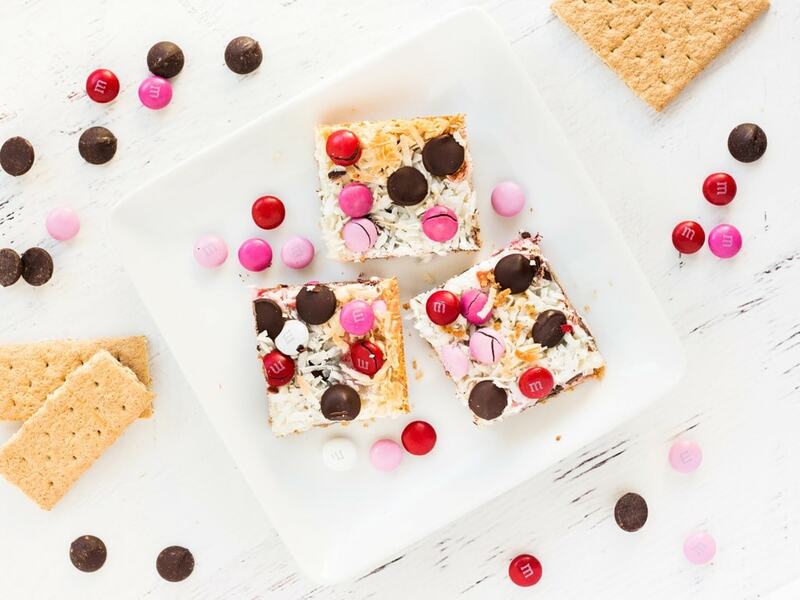 Make these chocolate coconut bars for Valentine’s Day as a sweet dessert. 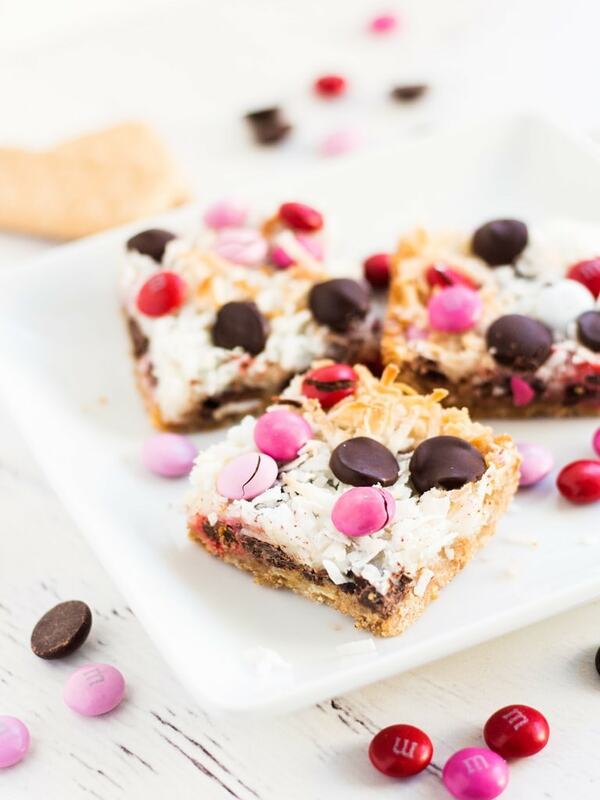 This magic cookie bars recipe is amazing and how could it not be? Graham cracker crust, toasted coconut and m&m’s make up a combination of delicious flavors. This is definitely one of my favorite easy dessert recipes. 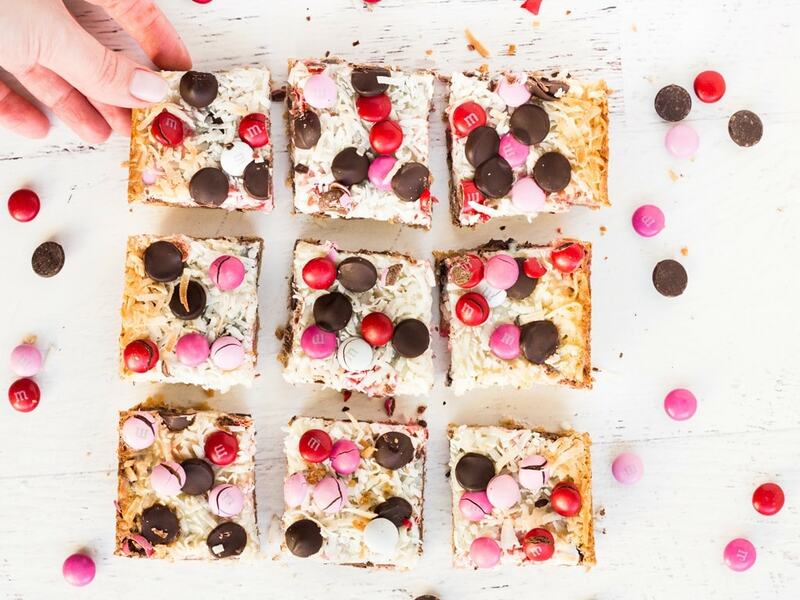 It is packed with layers of sweetness and anyone who is a sucker for toasted coconut and chocolate (like me) will have trouble stopping at just one magic cookie bar! I was just telling a friend about my first magic cookie bar experience. It’s a dessert my mom had been baking for years and one day in high school I needed a distraction from studying. I saw a plate of these coconut treats my brother and sister were obsessed with and when I tried the bars I had five in one sitting. No joke. Five. Needless to say I was unsupervised and got a stomach ache, but I didn’t regret it one bit. They were so good. I’ve since learned to limit myself to two bars and save the rest for later. This M&M magic cookie bars recipe is sinfully delicious because of the layers. Buttery graham cracker crust is topped with sweetened condensed milk, then coconut flakes, chocolate chips and M&M’s. I find that layering the coconut between two layers of chocolate creates the perfect arrangement of flavors. If all the chocolate is under the coconut, some of the coconut flakes will fall off when bitten into. If all the chocolate is on top of the coconut, the flakes will not get toasted in the oven. The solution is to do a sprinkle of chocolate chips and M&M’s, then layer all the coconut flakes, and finish with another sprinkle of chocolate chips and M&M’s! For Valentine’s Day I used red and pink M&M’s for a romantic touch. However, you can do any kind of M&M’s you want! Red and green for Christmas, blue and red for Fourth of July or even Reese’s Pieces for Halloween! 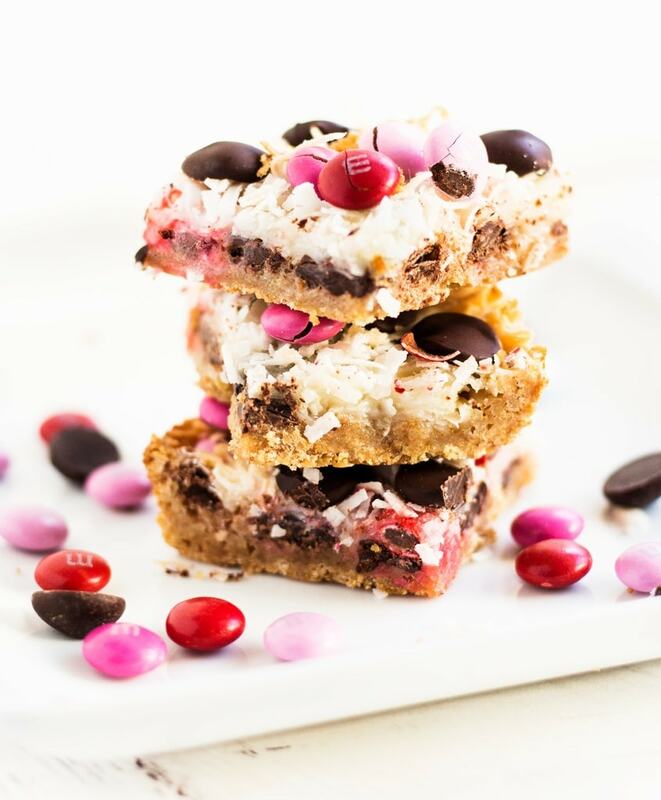 Use this M&M magic cookie bars recipe and bake a sweet treat for your sweetheart! Unwrap butter and place in 13-inch x 9-inch pan. Place pan, with butter, in the oven and preheat the oven on to 350* F. Melt the butter in the pan while preheating (5 to 10 minutes). Once the butter is melted, remove pan from oven and evenly sprinkle the graham cracker crumbs over the melted butter. Press the graham cracker butter mixture into the pan using the back of a spoon or bottom of a measuring cup. Pour sweetened condensed milk over the crumb layer. Spread by tilting the pan slightly (it's okay if it's not perfect). Sprinkle 1/2 cup of the chocolate chips and 1 cup of the M&M's over the sweetened condensed milk. Sprinkle all of the shredded coconut on top (most of the chocolates will be covered). Finish layering with the remaining chocolate chips and M&M's. Bake bars at 350* F for 25-30 minutes or until the coconut is golden brown. Remove bars from oven and cool completely. Cut and serve! ¹ I used a food processor to make the crumbs. You can also put graham cracker sheets in a plastic bag and crush the crackers with a rolling pin or the back of a spoon. ² Store in an airtight container at room temperature for up to a week. Bars can also be frozen for up to three weeks. So so good. I am going to make them for Valentines Day.